As much as I adore weekend brunch, I rarely drag myself out of bed in time to actually do it. Usually I grab an iced latte from Alfred's and call it a day. But on the occasion when I do get to indulge in this wonderful weekend ritual, I prefer to treat myself to something fun and decadent. And Blacksmith's in Downtown LA is no exception. The beautiful restaurant is located on a small side street off of Main (near perennial favorite Kazunori), and immediately surprises with its lovely outdoor patio and airy/glitzy space. Exposed brick, chandeliers, and cozy blue tufted booths give this spot a luxe industrial feel that lends itself well to the elevated American cuisine. While they serve dinner, happy hour, and even boast late night bites, daylight seems like a good way to fully appreciate the whole experience. Just like the interior, all the plates are beautifully presented. We started off with some lox on toast; the lox was especially colorful and very flavorful, while the bread was lightly toasted and fluffy in the middle. With some pickled onions and greens on top, it was certainly a mouthful, but light, flavorful, and well balanced. An excellent choice for those wanting to eschew typically heavy brunch fare. A favorite of mine, the Chilaquiles are pretty much a go-to order when I spot in on a brunch menu. I liked Blacksmith's elevated and tightly presented version, with a bit of spice, some creamy beans, a sprinkling of cheese, and a gooey fried egg on top. A great choice whether you're hungover or just really hungry. Finally, we ordered the Short Rib Benedict, which was really more of a deconstructed Eggs Benedict. 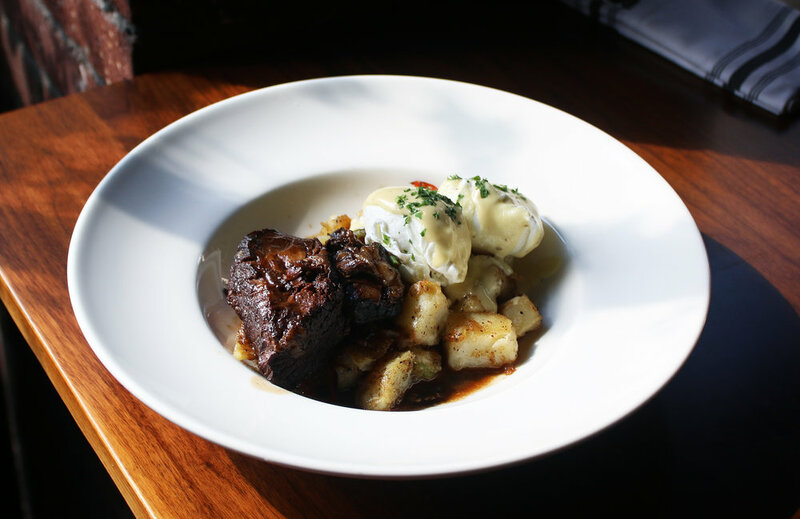 The big slab of short rib was tender, meaty, and flavorful, while the eggs were nicely poached and drizzled with a light, frothy hollandaise. It was all served over some crispy potatoes, which were definitely tasty and more flavorful than an English muffin. All together, it was a satisfying mouthful, and a punchy way to finish our meal. There's really one way to describe our brunch at Blacksmith's: lovely. The meal was simply a nice experience, from the tasty food to the airy atmosphere to the friendly service. It's an easy place to go back to consistently for a fun, low-key brunch, either with a date or a group of friends.